The Equine Sports Medicine and Surgery Service aims at offering our clients and our referring veterinarians a more “private practice-like” experience from the moment the phone call is made to make an appointment to the time of discharge. The Equine Sports Medicine Team focuses on offering service for the evaluation and management of conditions affecting the performance of our equine athletes including lameness examination, advanced imaging (Nuclear Medicine, MRI, and CT), orthopedic surgery (including arthroscopy and fracture repair), and upper respiratory evaluation (resting and dynamic endoscopy) and surgery (tie back, tie forward, DDSP, etc.). This service is operated by two clinicians, Dr. José M. García-López and Dr. Kirstin Bubeck, both Diplomates of the American College of Veterinary Surgeons (ACVS) and American College of Veterinary Sports Medicine and Rehabilitation (ACVSMR). 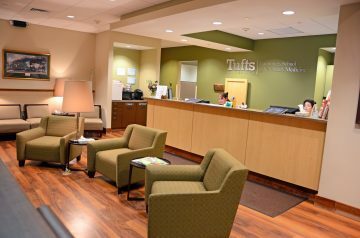 This new service operates closely with the Ultrasound Service, which is run by Dr. Katherine Chope and Dr. Wade Tenney. 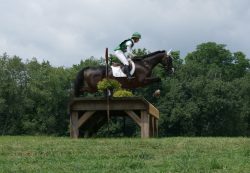 The Equine Sports Medicine and Surgery Service also counts on a Surgery Resident or Intern, a dedicated Veterinary Technician, Kelly McMahon BS, CVT, a dedicated Operating Room Veterinary Surgery Technician, Darlene Staplins, and a Client Liaison, Lisette Dubin BS. Ms. Dubin functions as our service’s main liaison and main contact to call directly to make appointments in an effective and efficient manner. Our team will include, on occasions, equine-oriented senior students with interest in sports medicine. As always, you can also feel free to contact Dr. García-López or Dr. Bubeck if you have any questions or need consultation regarding your case. During your horse’s visit, one of our team members will greet you and record a brief history of your horse. 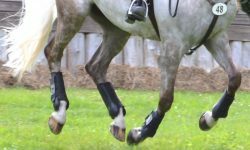 The clinician, resident, technician or assistant and senior student (when applicable) will then take you to begin your horse’s examination and diagnostics. 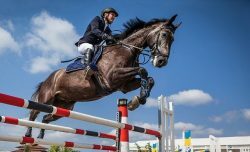 The Equine Sports Medicine and Surgery Team will guide you through your appointment and is more than happy to answer any questions you may have regarding diagnoses and treatment as they arise. After the exam, a care plan will be made for further diagnostics or treatment. The clinician will make a plan along with an estimate for further treatment as well as discuss both the plan and the estimated costs associated with it. In some situations, your horse may be required to stay over- night for additional procedures. 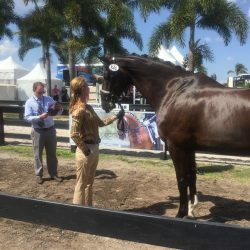 If that is the case, the Equine Sports Medicine Team will go over everything you need to know about your horse’s stay, including feed, hospital care, the procedure itself, and when you can expect to pick him or her up. At the end of your appointment we will give you and your veterinarian written and/or electronic discharge instructions that detail both the examination itself, as well as future care plans. A copy of the imaging studies performed during the visit will be provided. Any follow up appointments can be booked through Lisette either at the time of discharge or at a time more convenient for you. Whether you speak with one of our doctors first or call the front desk, you will be transferred to our Client Liaison Lisette Dubin to coordinate your appointment. The length of your visit is contingent on degree of diagnostics needed. Please bring any imaging and lab work you may have had done prior to your visit to help your team stay informed in your horse’s care. Please check in with our front desk before unloading your horse. They will be able to page the Equine Sports Medicine Team to let them know of your arrival. Please park in the client lot in front of the Hospital for Large Animals. There is plenty of trailer space available. Individual cars can park in the designated visitor parking areas. Our service prides itself on both the thoroughness of our veterinary care and the effciency of our practice. We do our best to minimize wait time for all of our clients. We make sure that each client gets the attention and services they need in order to have all of their questions answered. Payment in full is expected at the time of discharge for day appointments. For those horses that will be hospitalized, you will be provided an estimate in writing and are expected to leave a deposit of 75% of the estimate. Care Credit financing is available and hospital staff can direct interested parties in obtaining it. We appreciate the opportunity to provide services for you and your horse!